One of the most satisfying aspects of seeing your child begin the new school year is the growth your child can experience in and beyond the classroom. In a Montessori school setting, children receive a myriad of opportunities to gain academic prowess, expand social skills, and develop a deeper sense of confidence and purpose. As a parent, you can do so much to supplement what happens in the classroom and equip your child to excel throughout the year. But sometimes, when you get busy or are new to Montessori, it’s not always easy to know exactly what to do. So, we have compiled this handy guide to help you as you prepare your child to succeed in school. Incorporate healthy eating habits into your child’s day. One key to a child’s success in school is to ensure heathy eating habits are a part of their routine. After all, you can probably relate to how hard it is to concentrate when you’re hungry or haven’t been eating well. Your child faces the same need for nourishment. Feed them a nutritious breakfast before they leave the house. Prepare meals that are high in lean proteins like chicken or turkey, greens such as spinach, and fruits such as apples. Encourage them to drink milk, water, and healthy drinks rather than soda or sugar-laden juices. Keep their sugar intake low, especially in the morning when it can produce a sugar high, followed by a crash. Ensure your child has a regular sleeping routine. Children, especially young ones, benefit greatly from established, reliable boundaries, which give them a sense of security and help them develop self-discipline. This is particularly true when it comes to bedtime. Sufficient sleep helps your child’s brain development and emotional regulation, both of which strengthen their success in school. The American Medical Association recommends 11-12.5 hours for preschoolers and 10-11 hours for children 5 and older. Late hours can be hard on children, so make it a practice to get them to bed at a reasonable time each night. Limit their screen time — tablets, phones, computers, and TVs — to help them fall asleep faster. Encourage your child to sleep in their own bed, in their own room. Teach your child to be independent. So much of your son or daughter’s success in school depends on their individual determination to succeed. Often, parents can struggle with giving a child independence. You may be tempted to rush in to the rescue or speed their progress. It takes discipline to allow your child a chance to solve a problem on their own, while also providing appropriate support as needed. When your son or daughter is faced with a challenge, don’t swoop in to solve it before they have a chance to solve it themselves. Ask questions to help your child go through the process of critically thinking about their situation. Rather than taking over, ask your child, “How can I help you?” Let them lead the way. Encourage your child to develop a strong work ethic. Assigning your child household chores they can take responsibility for daily. Inviting their help when you are cooking, gardening, watering plants, feeding pets, and putting away dishes, so that work becomes a happy, shared experience rather than a dreaded task. Teach your child good self-care habits. When you help your son or daughter learn to care for themselves in positive, healthy ways, you are accomplishing two vital things. You are helping your child discover their own value, an attitude that will benefit them all their life. And you are also encouraging their emotional and mental well-being. Encourage your son or daughter to do the things they can do for themselves, such as putting away toys. Provide a variety of clothes that they are capable of managing on their own, such as shoes with Velcro ties, elastic waistbands, and pullover shirts and sweaters. Prepare school lunches that are easy for your child to manage. Slice sandwiches into four triangles, perfect for tiny hands. Insert foods into child friendly containers. Foster opportunities for social interactions. Your child will enjoy meeting and working with other children in the classroom, but what happens when they leave school for the day, or over the weekend? It’s helpful to encourage your child to practice their social skills outside of school, and it’s great for their self-esteem to provide fun times with friends. Scheduling play dates for them on a regular basis. Enrolling them in after-school activities or enrichment programs, such as art classes or sports. When you drop off your child at school or a play date, assure them you will return soon, keep your goodbye brief and positive, and return to pick them up on time as promised. This helps ease any fears your child may have about being separated from you. At Primary Montessori Day School, we believe children and parents can both enjoy a happy, successful, empowering academic experience that equips your child to excel intellectually, socially, and emotionally. 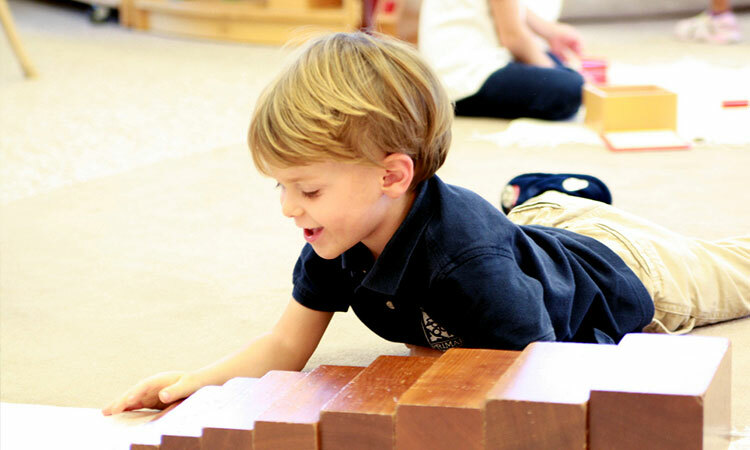 Achieving a balanced lifestyle that fosters lifelong learning is what Montessori is all about. You can learn more about how we equip your son or daughter to succeed in school and throughout their life with our free informational booklet, “How Montessori Gives Your Child a Balanced Education—at School and at Home.” Request your free copy today and discover how Montessori can benefit your child.